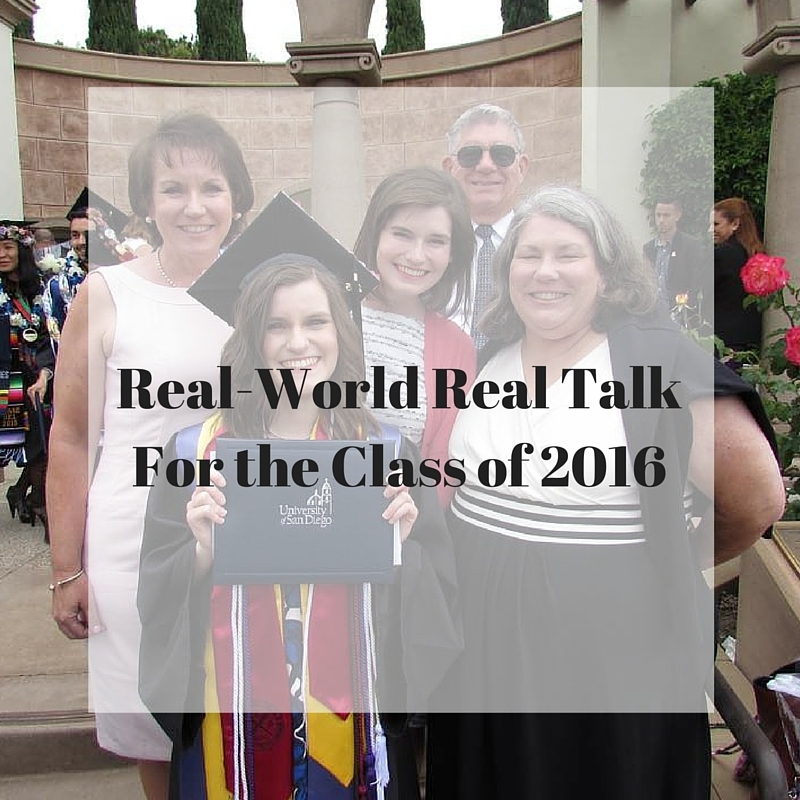 So you’ve graduated, or you’re nearing graduation, and everywhere you turn, people are warning you about that post-grad “real world”… whatever that even actually is. It seems mysterious and almost mythical, doesn’t it? All you really know about it is that it’s allegedly really hard. You’ll have to do things like start cooking all your own meals rather than relying on meal plans, and you’ll no longer be able to settle underneath the comfort of that beloved syllabus and the order it provides your chaotic life. You’ll have to make an active effort to socialize with people you won’t naturally see on campus between classes anymore, and you’ll have to do grown-up things like clean your house and make a real budget. And while there are a LOT of blog posts and web articles out there instructing you on the proper way to "adult," and I'm sure there’s a part of you that’s most definitely psyched to be escaping homework’s ruthless clutches for the first time in 16 years, I also know that right now, facing the multiple demands of adulthood probably also makes you feel like you’re staring down all three of Cerberus’ heads, frozen in fear and wondering... Where do I even begin??? Well, for starters, take a deep breath. Realize that this is a rite of passage endured by many, and you might be confused and terrified, but you will get through it. Promise. 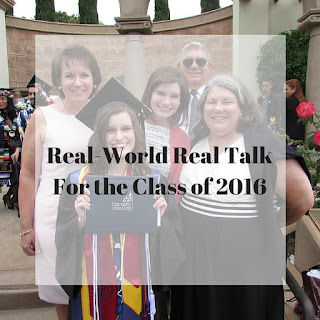 I know I’m no expert on adulthood just yet (I’ve only really been here for a year myself), but I do know that as someone who’s duking it out in the arena of “real life,” I’m at least sort of qualified to share my experiences with you, to tell you what it’s like out here, and to share what can loosely be considered my adulthood street savvy. If you’re looking for straight-up peer advice, I’m here to offer it to you. So, without further ado, I share some lessons I’ve learned as a post-graduate that I hope will add some much-needed perspective to that addled, “future is looming and I don’t know what to do” brain of yours right now. When in doubt, the best thing you can do is… something. That sounds like a terribly vague and pretty unhelpful piece of advice, doesn’t it? Sorry about that. What I mean is that there are going to be times in post-grad life, especially in that initial period when you’re wondering where you should move and and what career to pursue, when you’ll probably feel pretty lost. Anything is possible is an empowering maxim when you’re a kid who dreams of becoming an astronaut or a movie star, but as a twentysomething, this can feel overwhelming. Anything doesn’t help narrow down the field of choice at all. And when you’re leaving such a rigidly structured world as college, with its syllabi and papers and tests to rely on for order, knowing anything is possible is actually pretty terrifying. When anything is available to us, how do we decide what to do? And moreover, how do we know the decision we’re making is the “right” one? There are no “right” or “wrong” choices. There are only choices; what makes them “good” or “bad” is how we use them to grow… or not. Okay, so on a moral level, there are definitely choices we’d unquestionably consider “right” and “wrong.” But that’s not what I’m talking about here. I’m talking about all the times we pick one thing and then torture ourselves by wondering if it would have been better to pick something else. So in order to protect ourselves from feeling pelted with regret and a fear that we’re missing out on a “better” option, we sometimes don’t make any choice at all (Meg Jay, Ph.D., does a fantastic job of describing this in her book, The Defining Decade, which you should definitely read if you haven’t yet — it is a major roadmap for this period of life). I spent a lot of time after moving to Colorado wondering if I should have gone to New York instead, just to try it. After all, that’s where the bulk of jobs in the publishing industry are, and isn’t that what I said I wanted to do? Did I make the wrong choice in choosing to live with my sister? I don’t think so. I made the choice that made the most sense to me at the moment when I had to decide. Has it been harder to find a full-time job and create a sense of community for myself than it might have been if I’d moved to New York with my fellow Denver Publishing Institute grads and sought a career there? Maybe... and maybe not. I don’t know for sure what my life would have been like if I’d made a different choice. But who’s to say that if I’d gone to New York, I wouldn’t be wishing I were here instead? Or encountering some other kind of roadblock? Life is always going to have some problems. No matter where you are or what you’re doing, there’s going to be something you wish were different. So when you're looking at that wide world of possibility and thinking of where to start after you flip that tassel, choose the option that makes the most sense for you right now, and be at peace knowing that you can always change your mind later if it’s not working out. But give it an honest try first. Practice cultivating a healthy sense of gratitude for where you are, bloom where you’re planted, and know that you have the capacity to make the best of any situation. But the first thing you have to do is pick one. Overcome your instant gratification addiction. As a recovering instant gratification addict myself, I know that this is really hard. It’s not that we’re selfish or entitled, it’s just that our entire schooling careers have trained us to expect relatively instant results. The paper you spent two weeks writing will (usually) be returned to you in another two weeks, at most. And don’t pretend you’ve never asked a professor, “When are we getting our tests back?” in the very next class period. In our academic lives, we never had to wait that long for anything. This one’s a biggie. And I feel like something of a hypocrite here because I definitely do not have this one mastered. I don’t have any of these tips mastered, really. I’m just doing my best to make progress on them. But seriously. I compare myself to other people constantly, and with Facebook and Instagram there to slap everybody’s business right in our faces, it’s hard not to. Please stop this, friends. For one thing, social media is an illusion. A facade. It’s not real life. It’s what people want you to believe their real lives look like, so they pick the best parts of it to put on display. What social media doesn’t show are the struggles they’re facing — and believe you me, they are facing challenges; rainbows don’t come without at least a little bit of rain. Also remember that everyone is achieving their own version of success at their own rate. Your success isn’t supposed to look like anyone else’s, and that’s okay. I know the comparison bug bites hardest when we see other people doing the things we’d like most to be doing, too. But trust me on this one: as long as you are actively pursuing your dreams with baby steps that mean something to you, their journeys are irrelevant. You’re exactly where you need to be. I don’t have any hard evidence here to prove this, or any stories of my own, really, to show how I’m triumphing over this. I'm still struggling with this. Knowing that I’m in the right place for me right now is something I just have to take on faith, and on God’s promise that “[He] know[s] well the plans [He] has for [me]” (Jeremiah 29:11, NAB). I can say, however, that a good antidote for comparisonitis is keeping a list of all of the tiny wins you’ve experienced on your way to achieving your dreams. Get out a piece of paper, right now. Do it. Write down all of the little victories you’ve accomplished recently, those things that feel like milestones because maybe they’re things you didn’t think you could do (I would imagine that, given the enormity of the accomplishment of college graduation, that will probably fall somewhere on there, though this is definitely a big win, in my opinion ;]). Keep this list somewhere you can refer to it when envy rears its ugly head, and add to it frequently. Remind yourself of all the good you’re doing, ‘cause there’s a lot of it. Congratulations and good luck, Class of 2016! The real world’s got nothing on you.